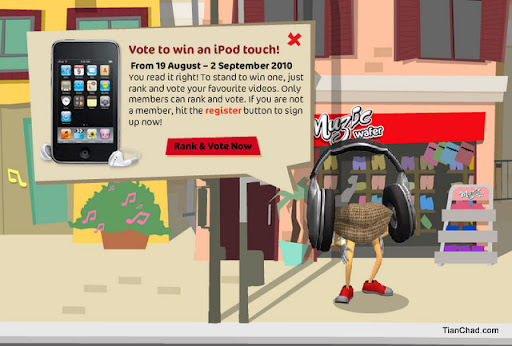 How to Win iTouch from Muchy's MiMic Muzic Contest? If you are following my Twitter [@tianchad] I am sure you can see my tweets about asking for votes for @msxeroz's Munchy Muzic Video right? Here is a post of what and how she record the video - "Nicole's Munchy Mimic Muzic Video". 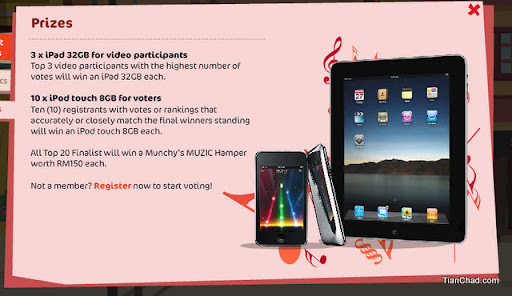 Besides the top three that can win iPad, we as VOTERS can win iTouch 8GB too~! Yes this is a contest for voter too!! If you want to get an iTouch without buying it here is what you should do. First go to Munchy's Mimic Muzic Contest Website and choose top 3 video that you like among the 20 finalist's video. 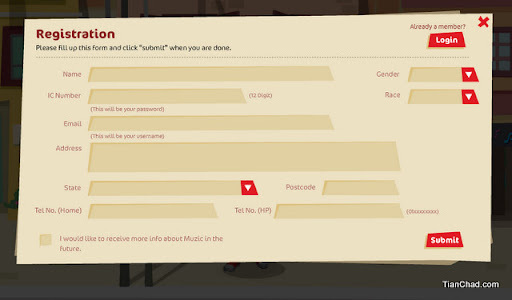 If you haven't been Munchy-fied, you need to register first so that you are eligible to vote and please remember to key in the right particular so that you will be contacted if you are one of the lucky voter~! To increase the chance of winning, it is advised that you vote for the video that you think he/she will win and with most supporter right? Haha. So as for my case, I always put Nicole's Video( 3rd row 4th from left) at 1st rank and choose another two out from 19 videos. That's all you need to do and vote daily to increase the chance of winning the iTouch by just voting for your favourite video~!